The security field evolves rapidly becoming broader and more complex each year. The common thread tying the field together is the discipline of management. 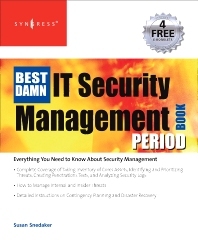 The Best Damn Security Manager's Handbook Period has comprehensive coverage of all management issues facing IT and security professionals and is an ideal resource for those dealing with a changing daily workload. Compiled from the best of the Syngress and Butterworth Heinemann libraries and authored by business continuity expert Susan Snedaker, this volume is an indispensable addition to a serious security professional's toolkit. IT security professionals, security managers, system administrators, and consultants. Business Continuity. Disaster Recovery. Risk Assessment. Protection Assets. Project Management. Security Operations. Security Management. Security Design & Integration. Since 1970, Robert McCrie has written, edited, researched, taught, and consulted broadly in issues related to security management (protection of assets from loss) and criminal justice. He edits Security Letter and was founding editor-in-chief of Security Journal, a research journal, and now is editor emeritus. He has been associated with John Jay College since the 1970’s. He joined the faculty in 1985, moving up the ranks to full professor and serving as chair of one of the largest departments, Law, Police Science and Criminal Justice Administration from 1997-2003. He later helped found his current department.